We know quality and style are important to you here at PFI Western Store. That’s why we carry a fantastic selection of Miss Me clothes and accessories to fit your Western style. 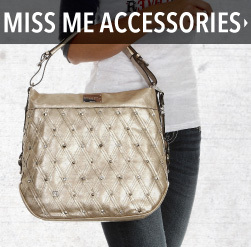 Miss Me has been making top quality women’s wear and accessories since 2001, including the most fashionable jeans, shirts, purses, and more. You’ll find plenty of rhinestones, patterns, colors, and embroidering in the variety of Miss Me clothes we’ve chosen for you! Browse the top selections in store, or order online to have your items shipped right to your door. Need help? Give our Women’s Clothing Department a call at 1-800-222-4734 and we’d be happy to help. At PFI Western Store, home of BootDaddy we have the latest styles in women's Miss Me jeans, Miss Me shirts, Miss Me handbags and accessories. 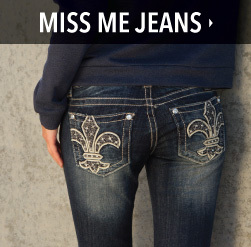 Ladies love the look of Miss Me jeans for their embellished pockets and great flattering fit. 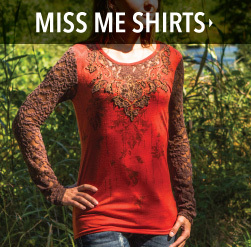 Shop our newest arrivals of Miss Me clothing and accessories and enjoy free shipping on orders over $150. You'll be bold and stylish in no time!